Luka Modric was crowned the Ballon d’Or 2018 winner on Monday night, but a significant number of football fans couldn’t believe Lionel Messi came fifth in the rankings. Although the 31-year-old fell short in the Champions League and World Cup this past year, he enjoyed another stellar campaign on an individual level to make an argument as the top player in world football. However, it must also be argued that Modric enjoyed a fine 12 months of his own, playing an instrumental role in Real Madrid’s third consecutive Champions League success, while guiding Croatia to their first ever World Cup final as captain. With that in mind, few can surely complain about the Croatian stalwart winning the award, but ultimately many were left baffled by Messi finishing fifth behind the likes of Antoine Griezmann and Kylian Mbappe, as seen in the tweets below. 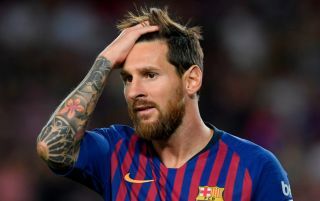 The entire process was blasted by many, but Messi will surely be more focused on collective achievements this season and helping Barcelona to more titles, which will undoubtedly help him get over any disappointment that he’s feeling currently. Nevertheless, the reaction to his ranking wasn’t kind as it’s the first time since 2006 that the Argentine icon has failed to make the top three. Lionel Messi coming 5th in the Balon D’or is an absolute joke. Imagine putting the best player in the world FIFTH. Disgraceful. 6th Balon D’or incoming next year. ? Just seen that Lionel Messi came fifth in the Ballon d’Or ?! What an absolutely hysterical competition that is nowadays! Lionel Messi, just like LeBron James is the victim of his own greatness. They have set standards so high that these awards can’t justify their greatness. They can keep their awards to themselves.